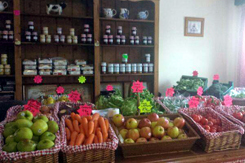 The Hayrack Farm Shop has a wonderful array of locally sourced fresh salads, vegetables and fruit. We are proud to support local farmers and throughout the year work in partnership with local growers who supply us with their produce when it is in season to ensure maximum freshness, quality and taste. Fresh Fruit Baskets, Hampers and Vegetable Boxes can be produced to order, just ask. We also stock a nice selection of quality jams, marmalades and chutneys. 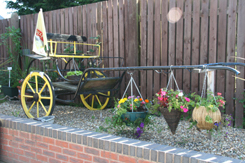 Throughout the year we have a colourful, varied display of garden plants, shrubs, pots and hanging baskets on sale. Our ranges change with the seasons so why not pop along and have a look what we have on offer? We're always happy to advise. We source all our fresh fruit, vegetables and flowers from farms within the Chester, Cheshire and North Wales area - usually within 30 miles of our farm shop!